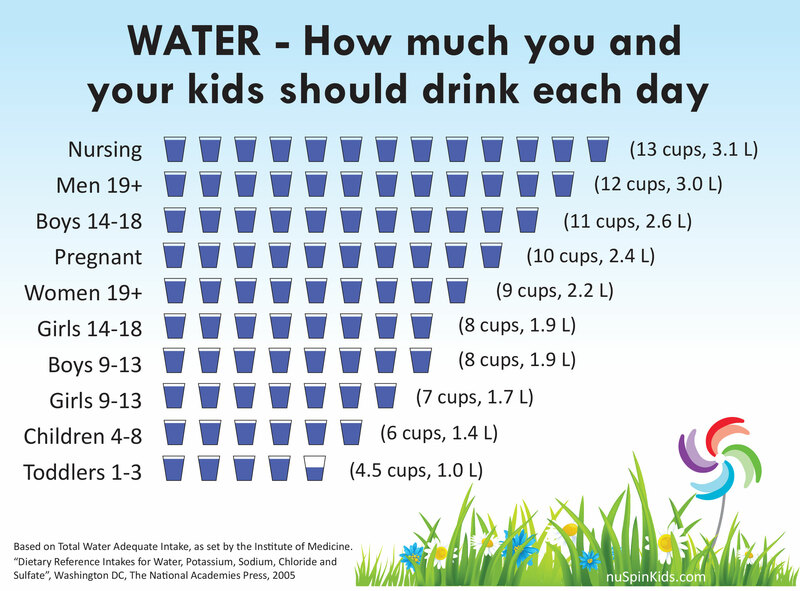 Home / Posts tagged "How Much Water to Drink While Pregnant or Breastfeeding"
How Much Water Should You and Your Kids Drink Each Day? Hydration Guidelines for Toddlers, Teens, Adults, and Pregnant or Nursing Moms. Water helps maintain the balance of body fluids, affecting functions such as circulation, temperature control, and digestion. Drinking sufficient water can reduce risk factors for constipation, kidney stones, and other chronic diseases. Drinking the right amount of water can also help control calories, keep muscles energized, and keep skin vibrant. While pure water is one of the healthiest beverages, you will get similar levels of hydration from other non-alcoholic beverages. So adult women should generally be drinking a combined total of about 9 cups of water, tea, juice, and other beverages each day to stay hydrated. In fact, your total water intake comes from both beverages (including tea, juice, and milk) and from foods (including soups, fruits, and veggies). This ratio is typically about 4 to 1, meaning that for every 4 cups of water you get from drinking beverages, you get about 1 more cup from the foods you eat. So if you happen to be on a liquid diet or you’re eating dried foods, you’ll need to bump up the amount of fluids you drink by about 25% to compensate. These guidelines for adequate intake of water are meant to cover the general needs for each life stage and gender group. However, your daily water needs will vary depending on your environment (temperature & humidity), physical activity level, health, and diet. Kids not drinking enough water? Use these 7 easy tips to get toddlers to drink more water. IOM (Institute of Medicine). Dietary Reference Intakes for Water, Potassium, Sodium, Chloride and Sulfate. The National Academies Press, Washington DC, 2005. EFSA Panel on Dietetic Products, Nutrition, and Allergies (NDA). Scientific Opinion on Dietary Reference Values for Water. EFSA Journal 2010, 8(3):1459. EFSA (European Food Safety Authority), Parma, Italy, 2010. Fluid Facts for Kids. Retrieved 11/12/2015. Mayo Clinic. Water: How much should you drink every day. Retrieved 5/17/2016.